匡翠萍, 韩雪健, 李文斌, 张甲波. 波流对人工岬头和海滩养护工程的响应[J]. 同济大学学报(自然科学版), 2019, 47(3): 339-346. 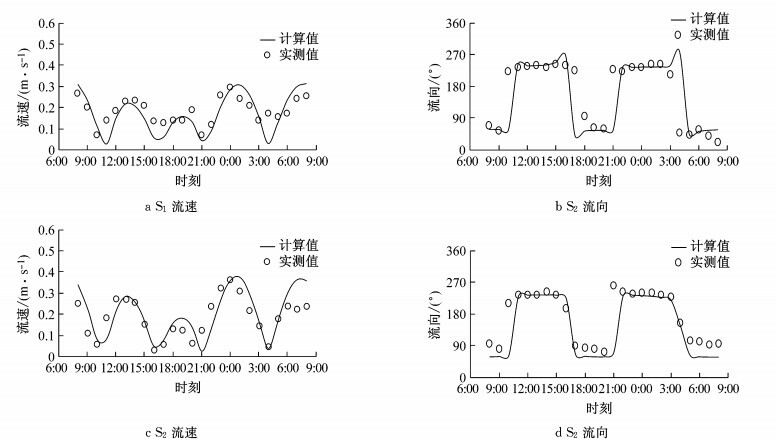 DOI: 10.11908/j.issn.0253-374x.2019.03.006. Abstract: Taking the coast from the Xinkai estuary to Nanshan as a study object, the artificial headlands and a beach nourishment project including underwater sandbars will be constructed to reduce coastal erosion. MIKE 21 was employed to establish tidal current and wave model, hence the responses of current and wave to artificial headland and beach nourishment project can be obtained. The velocity in front of headlands can be increased due to jet-like-flow, however, the velocity inside of the headland-bay is decreased, and a weak circulation appears in the back of the headland. After the beach nourishment, wave height increases at the crest of sandbar, while it decreases between and behind sandbars with more decreasing behind sandbars. Wave height decreases in front of the berm, and has more reduction during flood period than ebb period. The combined effect of artificial headland and beach nourishment project can effectively reduce the tidal currents and waves in the area encircled by headlands and sandbars, especially near shore, hence reduce coastal erosion. 式中:N(x, σ, θ, t)为波作用密度，σ为相对角频率，θ为波向；v=(cx, cy, cσ, cθ)为波群的推进速度，其中cx、cy为波浪在x、y方向上的传播速度分量，cσ、cθ为波浪在σ、θ方向上的传播(变形)速度分量；S是以谱密度表示的源函数；▽为四维梯度算子. 新开河口至南山岸线东西两端修建防波堤构成岬头，走向与岸滩基本垂直，东侧防波堤长约200 m，西侧防波堤长约300 m，为更好减弱潮流及波浪作用，西侧导堤前部60 m处向岬湾内弯曲约45°.具体为在MIKE 21软件中structure一项下中选择增加dike设置人工岬头条件. 海滩修复工程为滩肩补沙与2座水下沙坝吹填.补沙岸线长1.1 km，将人工沙滩的上限高程(即滩肩高程)设置为2.0 m(85国家高程基准)、滩肩由陆向海均为小于1:100的缓坡形式，设计高水位以下剖面坡度为1:10，直至与自然海床相交，整体向海拓宽沙滩30~50 m.吹填的2座水下人工沙坝离岸约200 m，每段沙坝长200 m，底宽80 m，坝顶宽60 m，坝顶高程-0.9 m.具体为在MIKE 21软件中通过修改地形数据设置海滩养护工程中的人工沙坝和滩肩补砂.人工岬头及海滩养护工程如图 1所示. 渤海大模型总面积约84 000 km2，节点数为14 183个，网格单元数为23 419个，唯一开边界是大连和烟台2个潮位站连线.测站潮位数据来自2015年潮汐表.为选择合适的秦皇岛小模型计算网格，比选了粗、中、细3种网格，网格数分别为6 412、9 099、11 748，最小单元尺寸分别为12 m、5 m、5 m，所需计算时间分别为2.71 h、3.54 h、4.31 h；潮流计算粗网格下结果与中网格下结果的最大相对误差小于9%，中网格下结果与细网格下结果的最大相对误差小于4%；综合考虑计算精度与计算效率，最终选择中网格作为秦皇岛小模型计算网格.秦皇岛小模型网格节点数为4 888个，网格单元数为9 099个，网格从外海到岸线由疏到密，外海边界分辨率约为4 km，新开河口至南山岸线最大分辨率为5 m.模型及网格如图 1，图中左下角为情况3. 小模型分为NE、SE、SW 3个开边界，采用流速和潮位控制的Flather边界条件，由渤海大模型提供.固边界采用不可滑移条件，即流速为零.涡黏性系数采用Samagorinsky亚网格尺度模型来计算水平涡黏系数，其中常数CS取为0.28，涡黏系数A上下限分别取为1.0×1010 m2·s-1和1.8×10-6 m2·s-1.曼宁数根据底部泥沙粒径分布，区域均值为74 m1/3·s-1，时间步长取60 s.海岸边界采用动边界模拟滩肩和潮间带的干湿交换过程，取hdry=0.005 m，hflood=0.050 m，hwet=0.100 m.
当PB≤10，认为拟合结果极好；当10 < PB≤20，认为拟合非常好；当20 < PB≤40，认为拟合好；当PB>40，认为拟合差. 图 5为情况2下新开河口至南山近岸海域涨落急时刻的流场及情况2与情况1流速差值等值线.该区域无工程时流速0.090~0.165 m·s-1，人工岬头修建后岬湾内部流速0.015~0.090 m·s-1，流速绝对减小约0.075 m·s-1，相对减小约45.5%~83.3%.挑流作用使得岬头前局部流速增加，西侧岬头前部流速增加0.060~0.140 m·s-1，东侧岬头前部流速增加0.020~0.040 m·s-1.涨急时刻，岬湾内靠近东侧岬头处、西侧岬头外侧处形成弱的环流；落急时刻，岬湾内部靠近西侧岬头处、东侧岬头外侧处形成弱的环流.即人工岬头修建后会在岬头后侧形成弱环流. 涨急时刻在岬湾内靠近东侧岬头处流速减小0.020 m·s-1，环流减弱；2个沙坝坝顶处，由于顶托作用流速增加约0.020~0.030 m·s-1；两沙坝间流速减小约0.015 m·s-1.滩肩补沙使得岸滩前段向海前移，两沙坝后侧的滩肩处流速减小0.040~0.070 m·s-1，其余滩肩处流速减小较少，约0.010~0.020 m·s-1.落急时刻与涨急时刻流速变化区域分布相似：岬湾内靠近西侧岬头处流速减小0.010~0.020 m·s-1，环流减弱；沙坝坝顶处流速增加约0.020 m·s-1；两沙坝间流速减小约0.010 m·s-1.2座沙坝后侧滩肩位置流速减少约0.050~0.060 m·s-1，其余滩肩处流速减小约0.010~0.020 m·s-1. 情况3下有效波高在涨、落急时刻有效波高变化范围相似：坝顶、沙坝后侧及沙坝间有效波高发生明显变化，相较于情况2，波浪在爬过坝顶时波高增加0.025 m，增加约10%；由于沙坝走向与波浪入射方向基本垂直，在2座沙坝后侧有效波高削减约0.050~0.100 m，减少约15.4%~30.8%.由于地形变化，两沙坝之间波高削减0.025 m，减少约10%.涨急时刻，滩肩前方海域有效波高减小0.050~0.100 m，减小约40%~50%；落急时刻滩肩前方海域有效波高减小约0.050 m，较涨急时刻减少小. (1) 新开河口至南山岸线海域流速0.090~0.165 m·s-1，整体流速较小；人工岬头修建后岬湾内部流速减小约0.075 m·s-1，挑流作用使得东西岬头前局部流速增加0.020~0.140 m·s-1.人工岬头修建后会在岬头后侧形成弱环流. ADAM D G, ANDREW S C, KATIE M P, et al. Learning from the impacts of superstorm sand, chapter five: Hurricane sandy: Did beach nourishment save New Jersey[M].[S.l. ]: Academic Press of Elsevier, 2015. ANDREW J, COOPER G, PILKEY E A. Pitfalls of shoreline stabilization: Selected case studies[M].[S. l.]: Springer, 2012. 匡翠萍, 王佳元, 马悦.洋河-葡萄岛岸线整治与修复工程设计方案研究技术报告[R].秦皇岛: 河北省地矿局秦皇岛矿产水文工程地质大队, 2016. KUANG Cuiping, WANG Jiayuan, MA Yue. 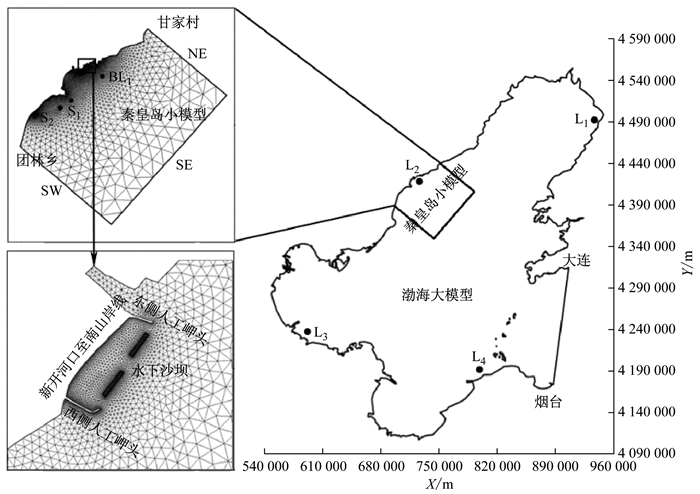 Report of shoreline evolution and hydrodynamic response to beach nourishment project at Yanghe River-Grape Island Region[R]. Qinhuangdao: Hebei geological and Mineral Bureau Qinhuangdao mineral hydrology and Engineering Geological Brigade, 2016. LI Wenbin. 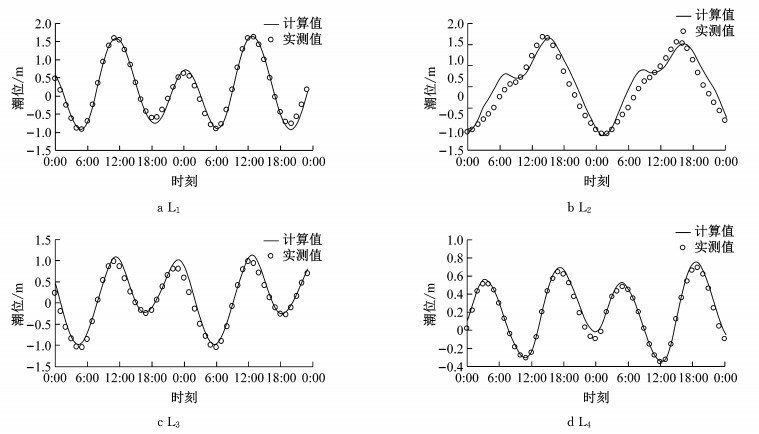 A study on responses of hydrodynamic and sediment and water exchange to beach nourishment project on Xinkai River mouth-Nanshan Coast[R]. Shanghai: Tongji University, 2018.